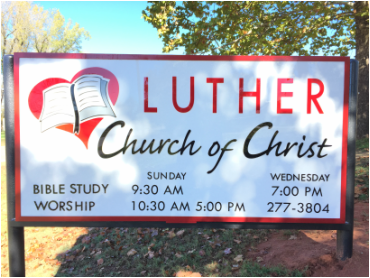 Welcome to the Luther Church of Christ! Sunday Worship Services......10:30 a.m. & 5:00 p.m.
For rides to classes, services, or information call 405-277-3804. Monday: Service Center opens to public from 10-11:30 a.m.
Thursday: Service Center open from 8-11:30 a.m. with food distribution from 9:30-11:00 a.m. Center opens again in the evening from 6-7:30 p.m. for Luther citizens to shop. Salvador Cariaga delivers a message about hope and sustainability to church members. While in the United States, Salavador is promoting Give a Goat, a program that raises funds for livelihood projects in the Philippines. Watch an interview with church member Dr. Al Mikel as he discusses his trip to the Philippines and the work he is doing there. Click here to read about and view photos of Chris Hill's trip to the Philippines. View a slideshow of Dr. Al Mikel's trip to a remote village in the Philippines. During his time there, Dr. Mikel installed a bio-filtration system and trained leaders about the concept so they could reproduce the system for other villages. Micro Biologist Professor Slideshow: Dr.’s trip from Cebu, Visayas, Philippines to Cebu City was created by TripAdvisor. See another Cebu City slideshow. Create your own stunning slideshow with our free photo slideshow maker. ©2011 Luther Church of Christ – All Rights Reserved. Website design by Tami McDaniels.